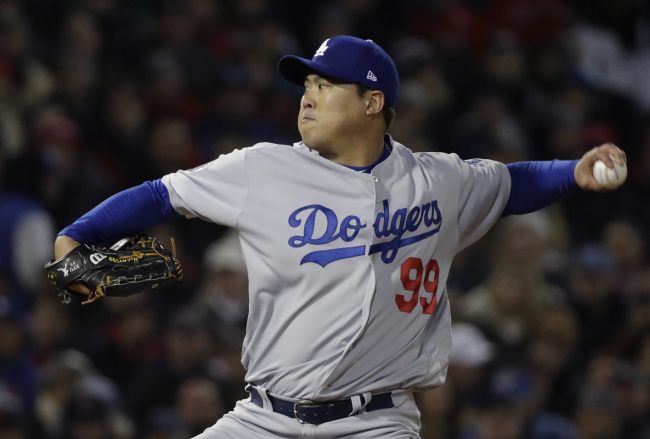 South Korean free agent left-hander Ryu Hyun-jin has received a qualifying offer from the Los Angeles Dodgers, giving him a choice to either stay with the club for one more year or explore the open market. The Dodgers made the one-year offer worth $17.9 million -- the mean salary of the 125 highest-paid players -- on Friday (local time). Ryu has 10 days to accept or reject the qualifying offer. If the player declines the deal, he will be free to negotiate with any team, including the Dodgers. And a team that signs Ryu away from the Dodgers must give his previous club one or more draft picks. He has played for the Dodgers since 2013 on a six-year, $36 million contract. Ryu is coming off a strong bounceback season, which included a three-month stint on the disabled list and his first World Series appearance. This was Ryu‘s second full season back from shoulder and elbow surgeries that limited him to one regular season start across 2015 and 2016. And after going 5-9 with a 3.77 ERA in 25 games last year, Ryu posted a 7-3 record and a 1.97 ERA in 15 starts in 2018. Among pitchers who made at least 15 starts, Ryu was second in ERA and in strikeout-to-walk ratio (5.93). He had a strong finish to the regular season by holding opponents to one earned run in his final 19 innings. Then in the postseason, Ryu started Game 1 of the National League Division Series (NLDS) against the Atlanta Braves, tossing seven shutout innings and strking out eight in the Dodgers’ 6-0 victory. He had a couple of mediocre outings in the NL Championship Series (NLCS) against the Milwaukee Brewers, allowing seven earned runs in 7 1/3 innings combined. 4-2 defeat after getting charged with four earned runs in 4 2/3 innings. The Dodgers lost the series in five games, and Ryu never got another chance to start. Ryu will be 32 next year and given his history of injuries, the $17.9 million on the table is likely much higher than what he could command from other teams annually.